Why are you still getting the Ruudy6 wrong? Stop at 1500! If you’re departing Teterboro any time soon, make sure you stop at 1500 feet – and have a good look at the rest of the RUUDY 6 departure. That’s the message from NY ATC, and the Teterboro Users Group. 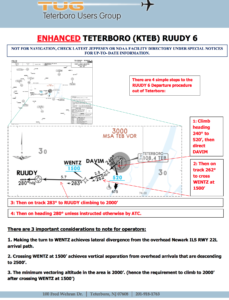 The FAA has reported over 112 pilot deviations on the KTEB/Teterboro RUUDY 6 SID. The Teterboro Users Group has asked us to remind all pilots that strict compliance is required, especially vertically. The Ruudy Six departure continues to incur both lateral, but in particular, vertical pilot deviations. Due to the proximity of Newark and other area airports it is imperative to follow the RNAV(RNP1) departure procedure to Performance Based Navigation (PBN) standards. Do not drift left off course to avoid noise monitors. Do not climb above 1500 until passing Wentz intersection. There is only 1000 feet of separation with overhead traffic at Wentz. When issued the clearance to “climb via the SID” all altitude restrictions must be complied with as depicted on the chart. Attached are excerpts from the Aeronautical Information Manual and the Controllers handbook explaining the Climb Via procedure. An expanded explanation is in chapter 4 and 5 of the AIM. There has been an extensive education campaign underway for a long period including guidance material, pilot meetings, educational podcasts and even a FlightSafety International eLearning course. 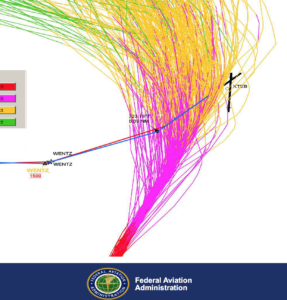 Despite these efforts, pilot deviations continue to occur. A great guide has been created by Captain Belastock and its very useful for any crews operating out of KTEB. Know of any other procedures with unusually high non-compliance?